Get into the Jungle Spirit in the deepest and darkest rainforest you’ll find anywhere online. 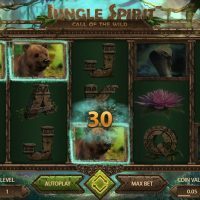 Jungle Spirit is a dark and aggressive slot game with hostile-looking animals, a gloomy backdrop, and belligerent gameplay. But it’s not dark in a bad way, oh no. It’s dark in a really cool way. 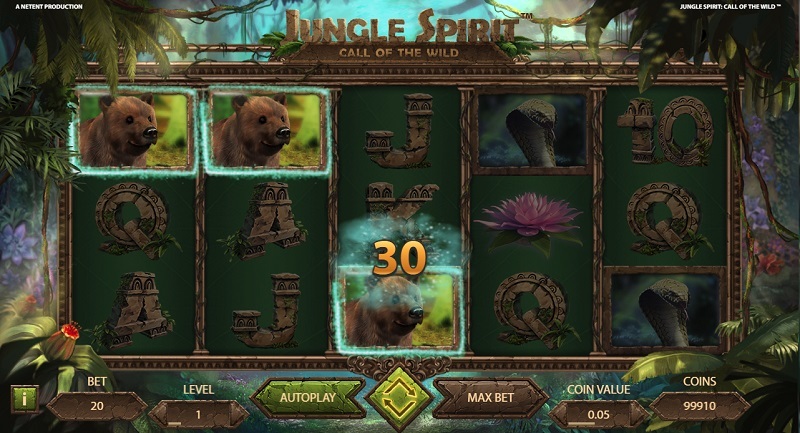 Jungle Spirit feels immersive, it feels like you’re living and breathing the game with every spin that goes by. Net Entertainment do a great job at that. They make the visuals look so realistic, so lifelike, so three-dimensional, so powerful – and the animations compliment it beautifully. 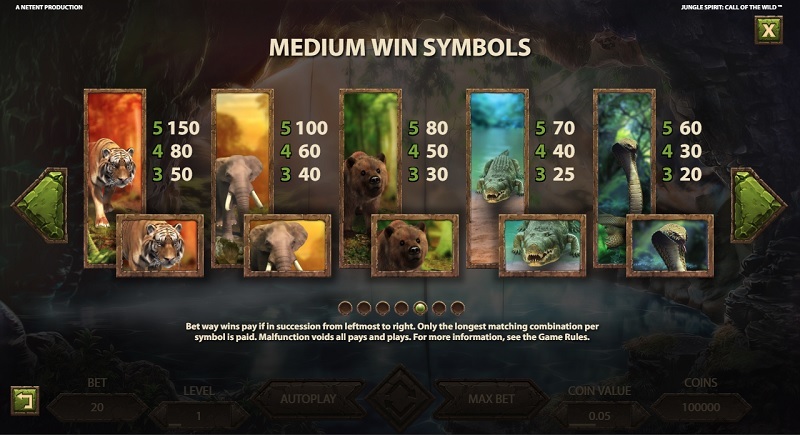 With regards to symbols, like we said above, they’re all hostile looking animals with a tiger, an elephant, a bear, an alligator, a snake all featuring plus the traditional A’s, K’s, Q’s, J’s and 10’s. The best symbol to hit is the tiger which pays out odds of 150/1 should you hit five in a row. 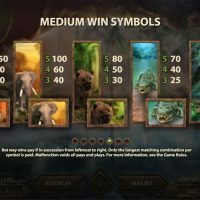 The bonus round, which is triggered by hitting three flowers on any of the five reels, consists of free spins, though you get to choose how many you get. However, the fewer spins you choose, the bigger wins you’ll be able to get per spin. 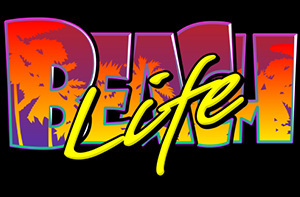 Have a look at the video at the top of the page to see how it all works. 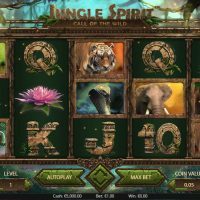 You can’t bet on different lines on Jungle Spirit but you can bet between 20p and £100 per spin. The house edge is a decent 3.53%. 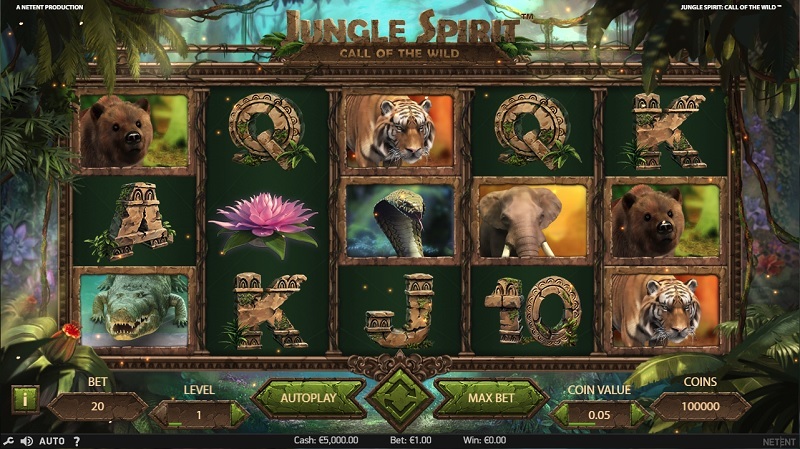 There are quite a few slot games out there which relate to the jungle, but this may just be the best of the lot. 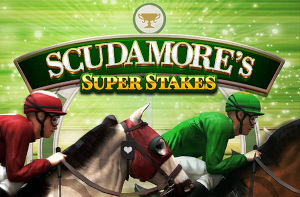 The graphics are striking, the animations are stunning, the bonus round is unique, and the house edge is very competitive. 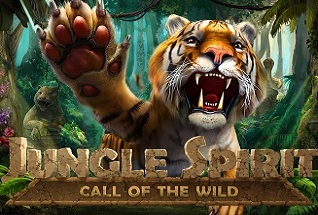 There’s nothing that lets this game down, and if you like something that’s a little bit dark and a little bit aggressive, then you’re going to love Jungle Spirit.